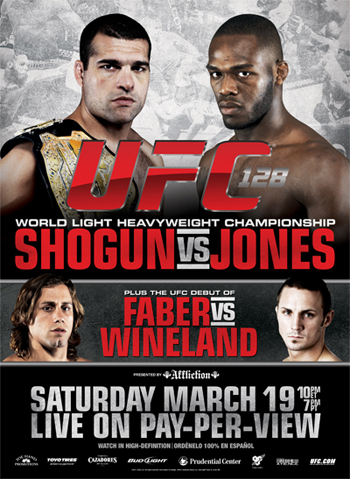 “UFC 128: Shogun vs. Jones” will be jumping off this Saturday inside the Prudential Center in Newark, New Jersey. The highly anticipated card features a light heavyweight title affair between skyrocketing superstar Jon Jones and champion Mauricio “Shogun” Rua. If you’re unable to attend this weekend’s show, Facebook will start things off by streaming two live preliminary bouts at 8PM ET/5PM PT. Spike TV kicks off the televised portion of the night’s festivities with another pair of free prelims at 9PM ET/6PM PT. Fanatics will have to pay for the good stuff after the freebie sessions when the pay-per-view broadcast begins at 10PM ET/7PM PT. Dana White, Mauricio “Shogun” Rua, Jon Jones, Urijah Faber, Eddie Wineland, Dan Miller and Nate Marquardt are expected to attend. The media session is free and open to the public. 5thRound will also provide a live stream. All of Friday’s festivities take place inside the Prudential Center and are free and open to the public. 5thRound will offer up live streams, as well.